This curriculum is aimed at students with intermediate and advance experience of coding. It aims to provide students with an understanding of the role computation can play in solving problems. It also aims to help students, to feel justifiably confident of their ability to write small programs that allow them to accomplish useful goals. Students develop their programming skills while learning about lists, defining procedures, using webcam sensing, and debugging problematic code. They will broaden their understanding of variables, operators, and event-driven programming while applying their existing knowledge in new ways of thinking about code. 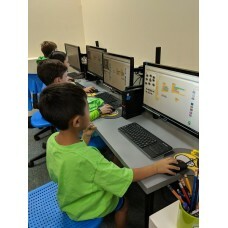 We will use Scratch, a graphical programming language developed at MIT, students learn fundamental programming concepts such as variables, loops, conditional statements, and event handling. As we teach a mischievous cat to dance, explore a maze, or play games, students learn how to use math and computer code to think creatively. How to create apps, games, and programs. Games using complex logic and program design. Programming skills while learning how to debug the problematic code. Refund Policy NO REFUNDS ON UNUSED CLASSES. Sessions must be used by June 5, 2019.